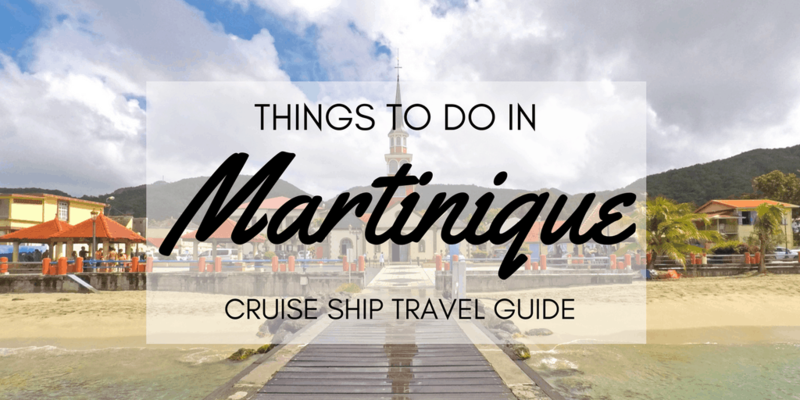 Here’s our favourite way to explore Martinique for the day. When you only have a day to visit a new place, such as when you’re travelling from a cruise ship, you’ve got to make the most of your time. 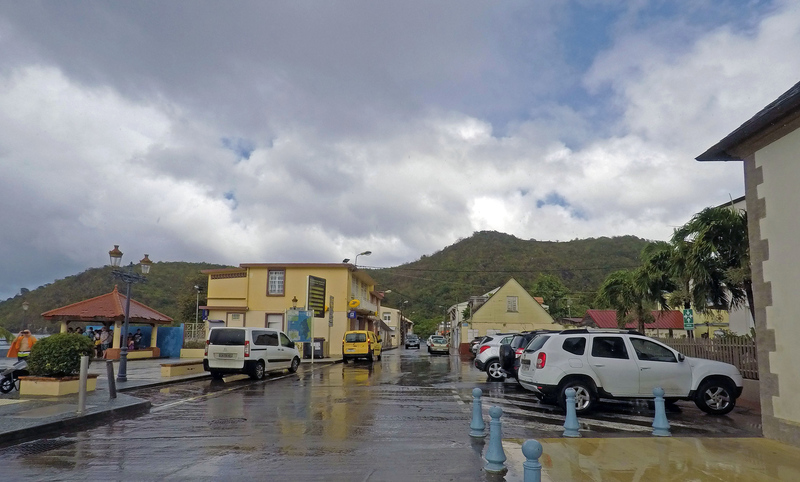 There are so many things to do in Martinique that it’s impossible to see everything in eight hours. 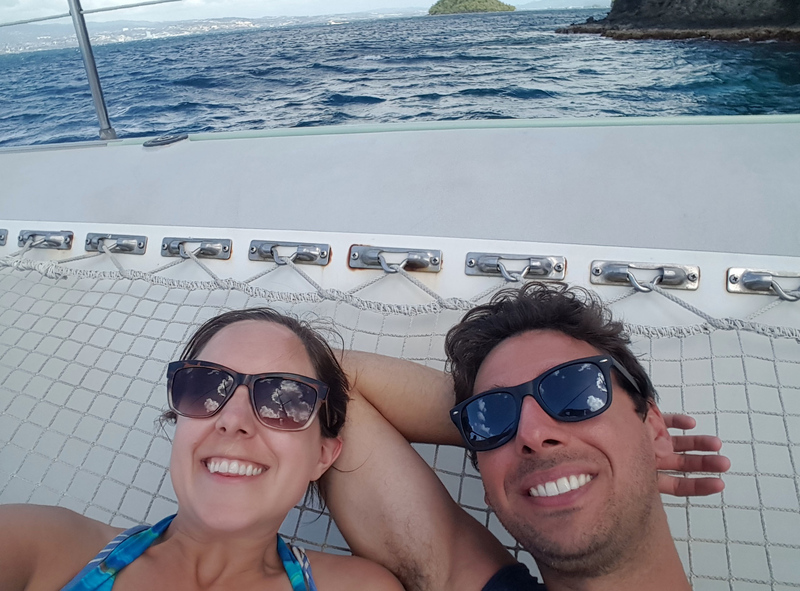 Justin and I booked a cruise ship excursion in Martinique – a catamaran sailing tour that combined a sailing trip, snorkeling, discovering a small town, and exploring a secret cave by boat. Yes, we did all of this in about four hours! 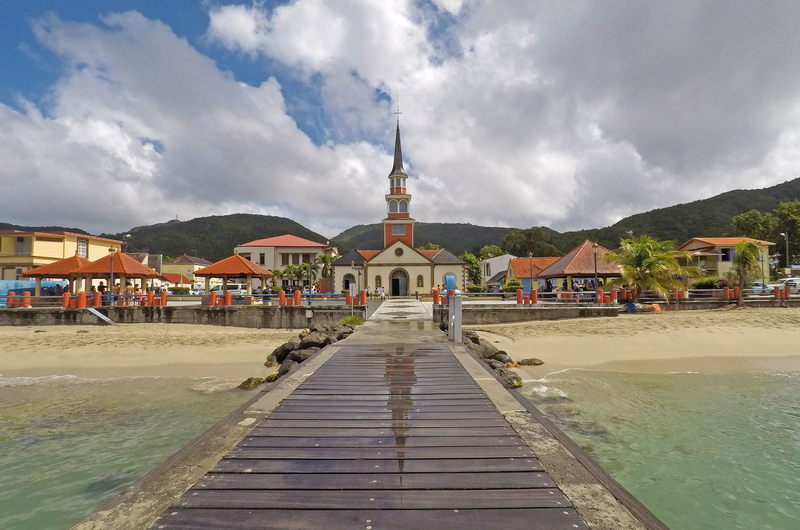 Martinique is a charming and spectacular destination that left us wanting more. 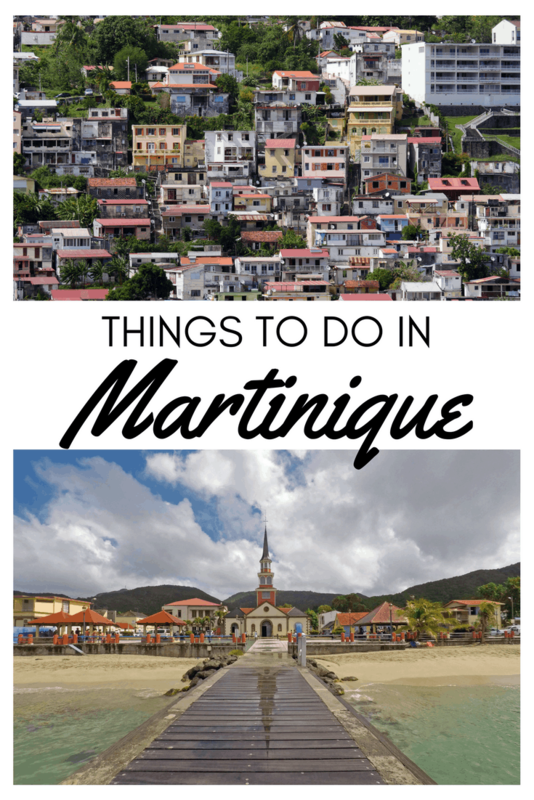 Have you ever visited Martinique? What’s your favourite thing to do there? 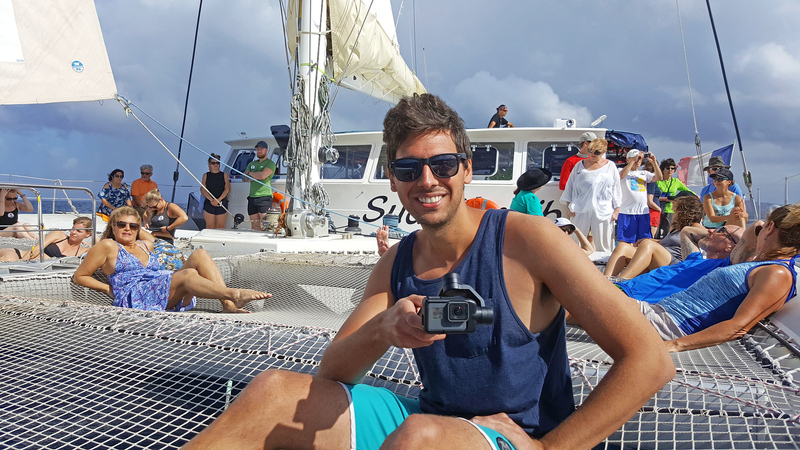 Watch how we spent an incredible day in our Martinique travel video! 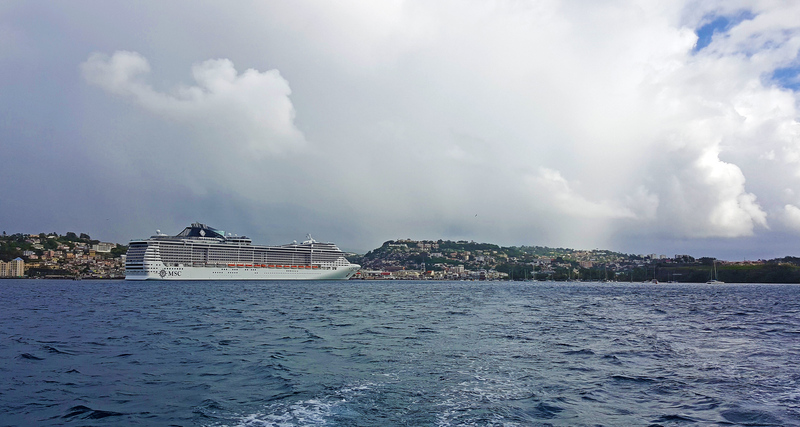 We purchased our sailing tickets through our cruise ship, the MSC Divina. The tour started in the morning, just after the ship reached the port in Martinique. 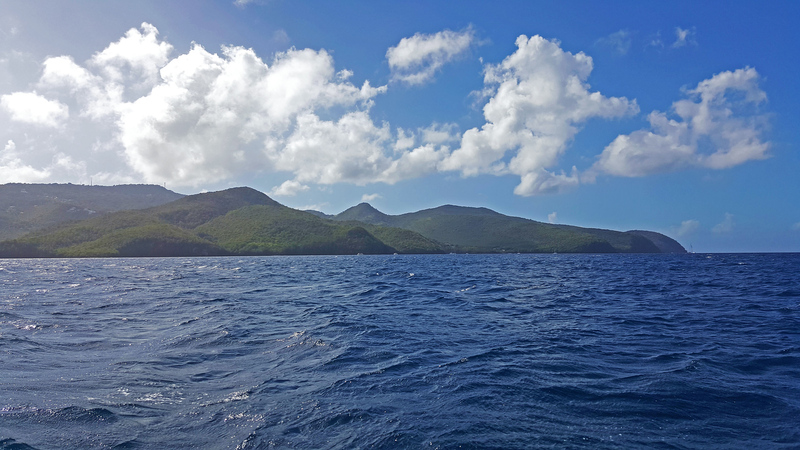 We boarded a catamaran and followed the perimeter of the island, drifting through the Caribbean Sea. Our captain was an interesting fellow. He spoke perfectly good English, which was great as Martinique is a predominantly French speaking island. But, most of the time, he chose not to speak any sort of language at all. Instead, a series of loud chortles and chirps came out of his mouth that sounded like a mixture of a bird and a dinosaur. It was also incredibly loud. I have no idea how he was able to physically create sounds at that volume. However, every time he made one of these sounds, one of us would jump a little in our seat. Justin and I laughed so much over this. The captain cawed at the crew on passing boats, fellow crew members, and the passengers of our boat, too. It was equally shocking and hilarious. We met some friends on this excursion – a lovely Australian couple who we ended up joining for dinner back on the ship a few times. While it was a little bit difficult to meet people on this cruise, it was great to meet such a nice couple with similar interests. 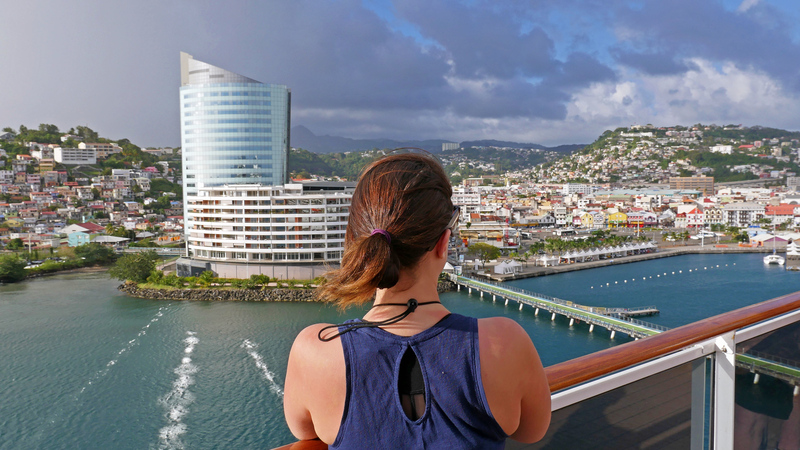 We have no problem making friends with people of all ages, but for some reason, this cruise didn’t seem like it was conducive to meeting others and making new friends as easily as usual. 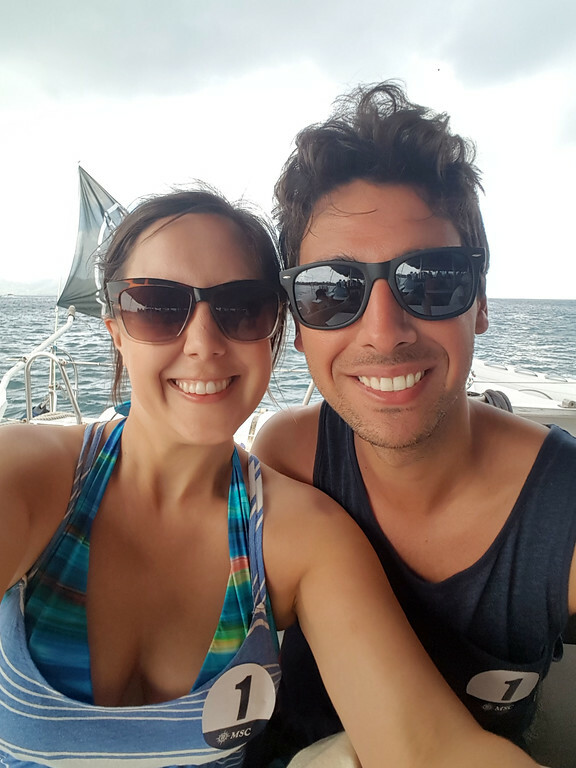 At the same time, there was a terribly annoying woman on our catamaran sailing who became obsessed with the fact that Justin and I weren’t married. Somehow in her mind, it wasn’t good enough that we live together, work together, have a blog together, have cats together, and have a life together. She kept asking personal questions over and over again, as though she was trying to somehow convince me to leave Justin because he hadn’t popped the question. The lady even yelled across the water at us while we were snorkeling! If this lady somehow happens to stumble across this blog, please don’t try to play therapist with strangers who are happy in their relationship. It just makes things awkward and strange. Our catamaran sailing involved getting to know our fellow passengers through the conversations we made (both the good and the bad), and taking in the beautiful scenery all around us. Like many other islands in the Caribbean, Martinique is a lush, green, mountainous island. It’s located between Dominica and St. Lucia. Martinique has beautiful beaches, rainforests, and brilliant areas to hike. It still has an active volcano, but it has remained quiet for quite some time. Mount Pelee last erupted in 1902, killing 30,000 people and wiping out the entire town of Saint Pierre. Don’t worry, geologists keep a close watch on it. If you’re staying in Martinique for longer than a few hours, you can embark on a hiking trip to the top of Mount Pelee. 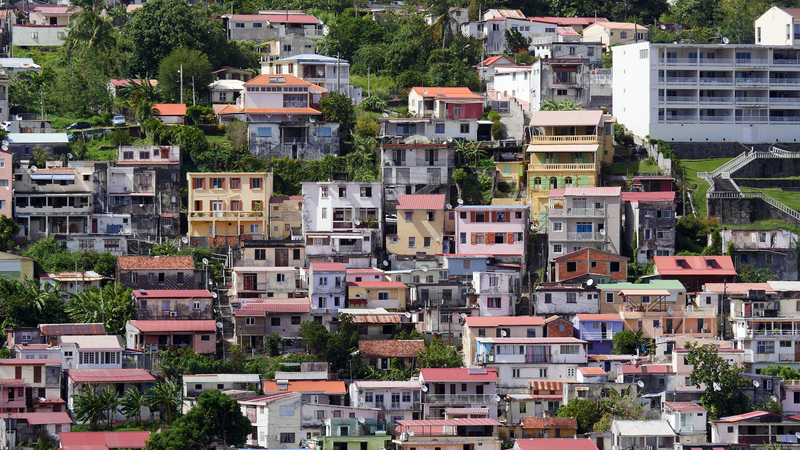 Martinique is part of the French Republic and accepts Euros as its currency. 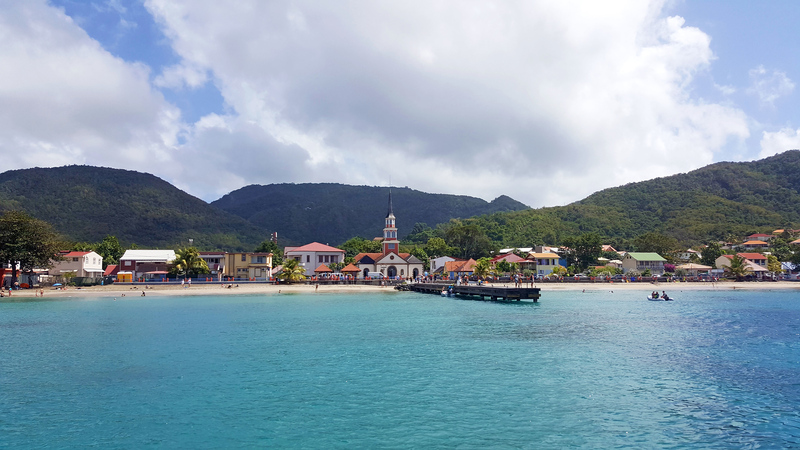 After about an hour, our catamaran stopped at the edge of Petite Anse Martinique (Les Anses-d’Arlet), a small coastal town. There was a good amount of coral here with lots of tropical fish. Justin and I donned our snorkeling equipment, included in our excursion, and plunged into the water. There were many varieties of fish in the water. It wasn’t the best snorkeling I’d ever witnessed, but it certainly wasn’t the worst. Snorkeling in Martinique was a great way to spend the morning as I adore poking my head underwater to take a look at sea creatures and plants. 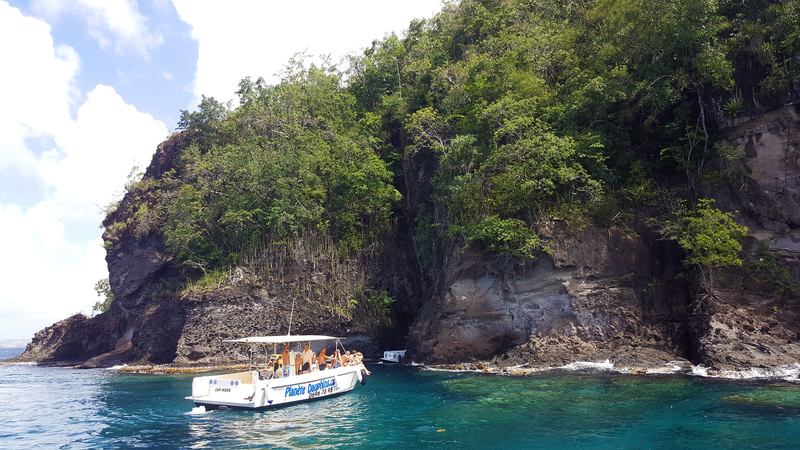 During our snorkeling trip, we also had the option to take a dingy to land in order to explore the town. After we had snorkeled for about a half hour, we decided to check out Petite Anse Martinique. However, it had just started to rain. I think that I’m a really stubborn person and wanted to check out the town, no matter what. As you can see in the video posted above, this was perhaps not the best idea in the world. It wasn’t just raining a little bit – it was a massive downpour. 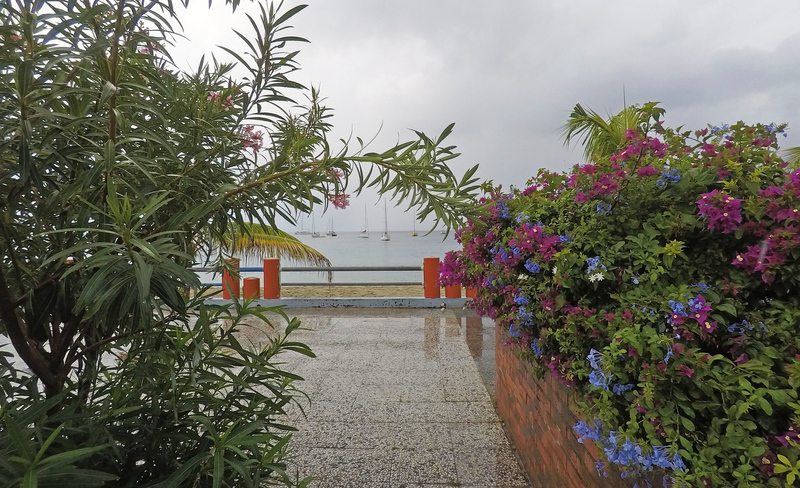 We ended up running from the dock to a tiny roofed building to hide from the rain. It was too intense to walk around and do anything there. Finally, the rain let up, but it was too late. We had to head back to the catamaran. We walked up and down one street before calling it a day. I really wish we had more time there. 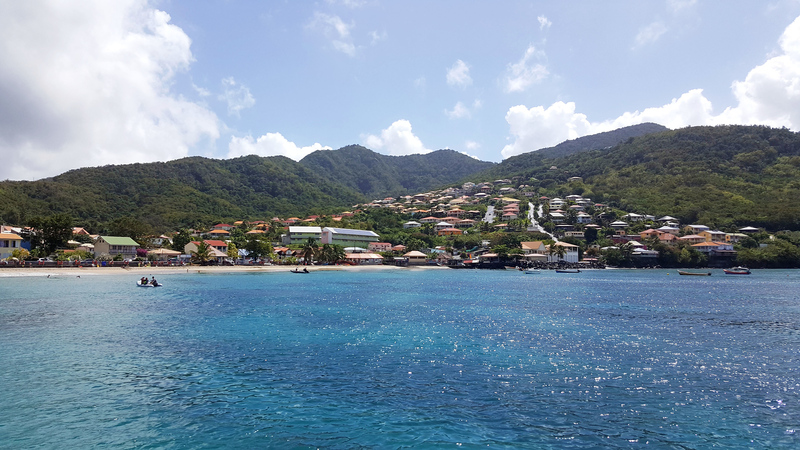 An hour simply isn’t enough to snorkel and explore a small town. I’d love to see this portion of the excursion expanded to at least two hours. I suppose we’ll just have to return someday! 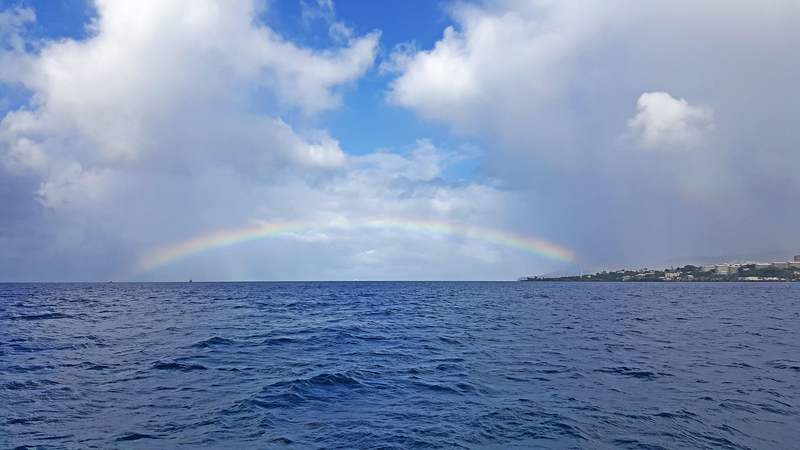 Naturally, right before we were set to go back to the catamaran, the skies cleared and the sun started to shine again. Sailing back towards the boat, we made a surprise stop that was quite possibly my favourite part of the excursion. 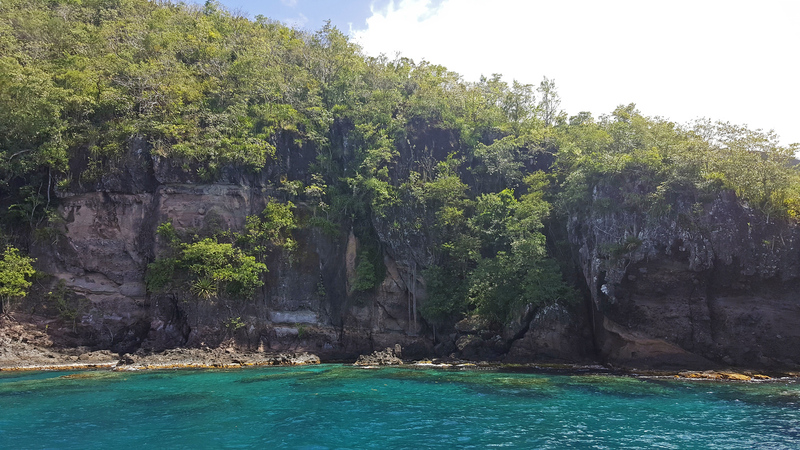 Our boat slowed down and came to a stop right beside a tall, rocky cliff. The cliff edges split apart to reveal a narrow cave. The sea water here was the most vibrant shade of turquoise. As the opening was very narrow, we boarded the smaller dingy, eight people at a time, to explore the cave. 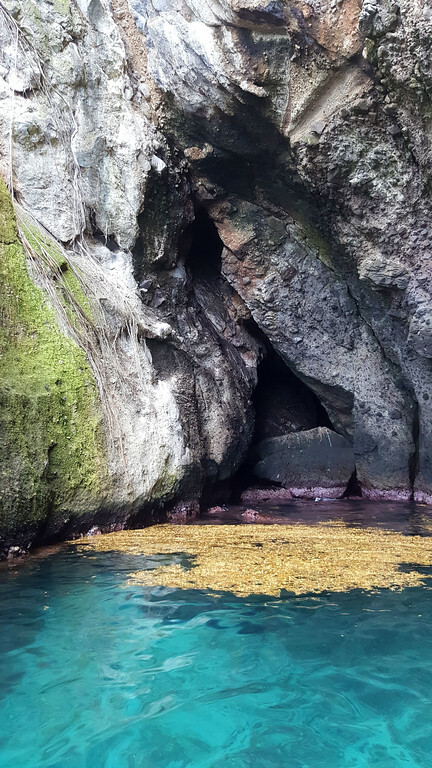 Slowly, we rode the boat into the cave and heard high-pitched squeaky noises. 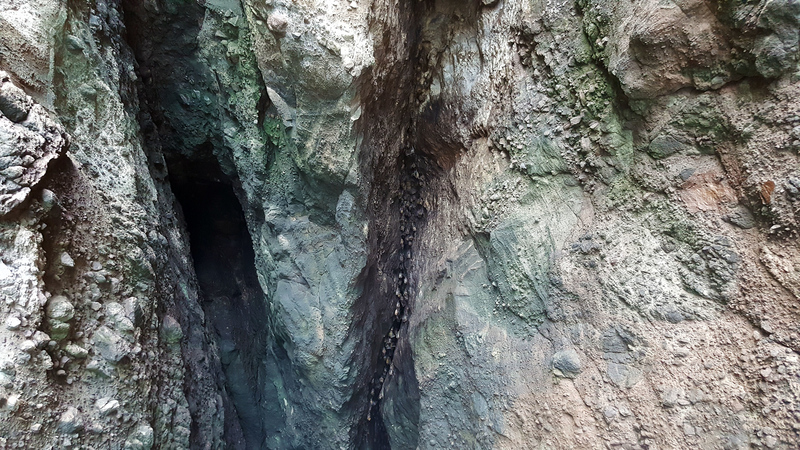 Hundreds upon hundreds of bats lined the top of the cave walls. Don’t worry, they were too high up and couldn’t care less that we were there. Even if you’re afraid of bats, they didn’t leave the walls or come close to our boat at all. It was such a sight to behold. The vivid, turquoise waters paired with the extremely high cliff walls was something unique and unexpected. We saw a couple of other boats approach the cave, but they all had to watch from afar as none of them had smaller boats to fit inside the cave. Only our tour guides were prepared, and we were so grateful for this. For the rest of the tour, we simply relaxed on the boat and enjoyed the ride. We lounged in the sunshine and gently floated with the waves. It was the perfect end to our journey. 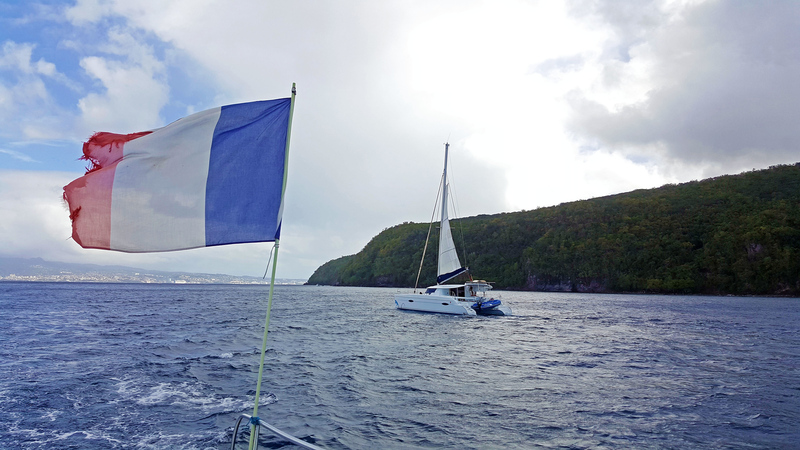 Out of all the things to do in Martinique, we highly recommend that you spend your day at sea. While we didn’t know the name of the tour company when we booked the excursion (we booked it through the cruise ship), the tour company is called Diamond Rock. 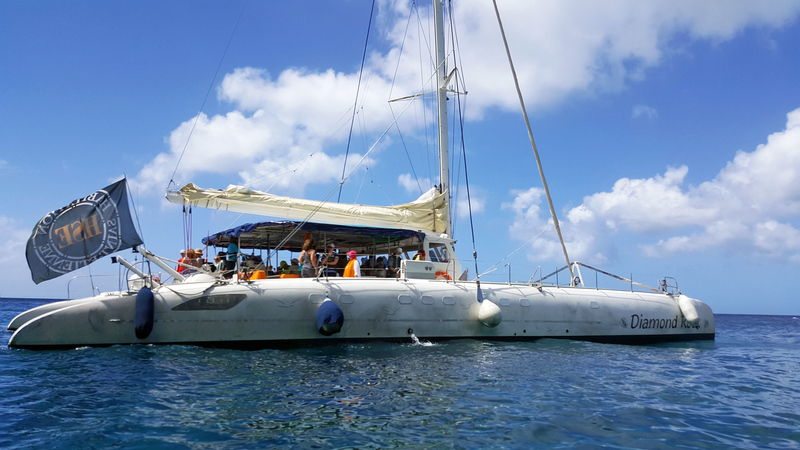 We highly recommend that you book a catamaran tour of Martinique with them, whether it’s an excursion through the ship or on your own. We thoroughly enjoyed this experience and wouldn’t have wanted to spend our day any other way. While we could have used the rest of our afternoon to grab a quick bite to eat and explore the port area, there was a special showing of a film on our cruise ship that we didn’t want to miss. Next time, I’d like to wander around the port or perhaps grab a coffee or a bite to eat in town. The view of Fort de France from our cruise ship, however, was stunning. Go hiking. There are dozens of trails in Martinique to explore with spectacular mountains, intriguing rainforests, and amazing scenic views. Lounge on the beach. Martinique is home to white sandy beaches, as well as a black sand beach. Taste the local rum. There are several rum distilleries on the island, and it would be fun to sample them. Interested in seeing more photos? 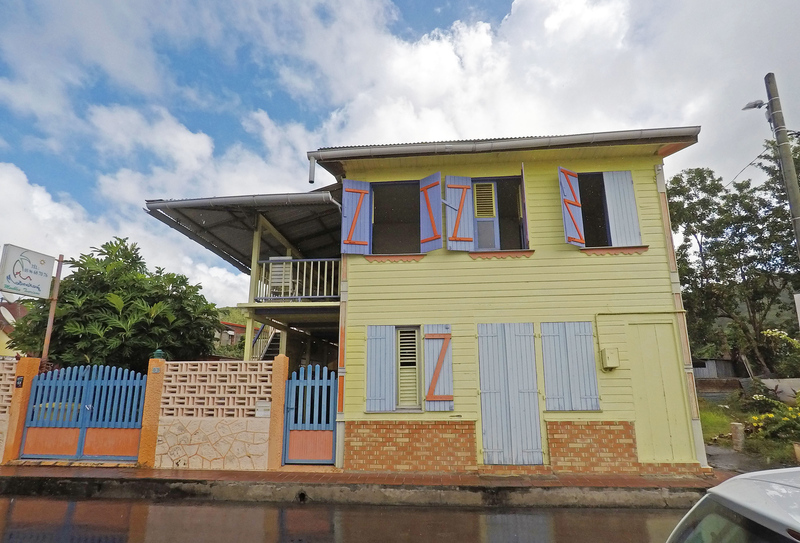 Check out our travel photo album of Martinique! You can also purchase photos, canvas prints, and housewares made from any of our photos. LOL on the bird-dinosaur captain mix hahaha. We often find characters like this during world travels. Always speak perfect English in foreign lands. You get excited. Ready and raring to connect. Then….silence. Maybe you toss a word or 2, or few lines out. A nod, then, back to Space Cadet Land ;) Really fun breakdown; just love that little story. We have met characters like this the globe around. This would be a dream trip for us! We never really had a catamaran sailing trip even if we have been cruising. I love that you can meet people from all over the world and chill out! 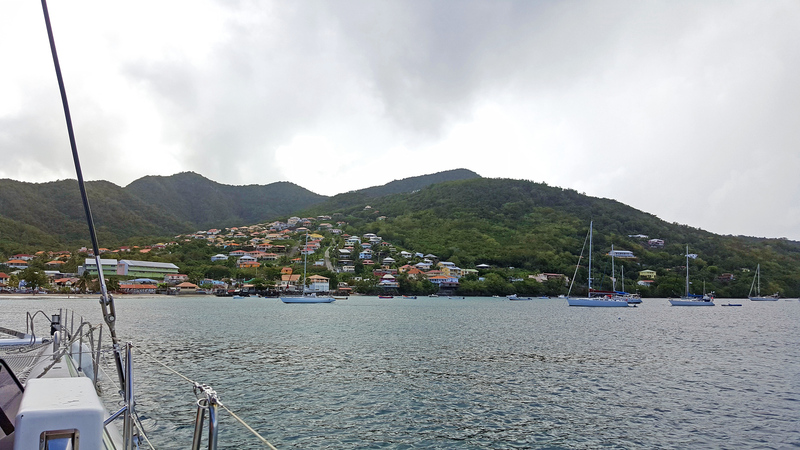 Cruising amidst some of the lovely Caribbean islands is high on my travel wish list. Lets see when that happens. I had never heard of Martinique until now, but seems interesting. Really weird for that lady to pepper you guys with so many personal questions….none of her business about your private life. But you have such encounters when you travel, cant be helped. Such a beautiful place. 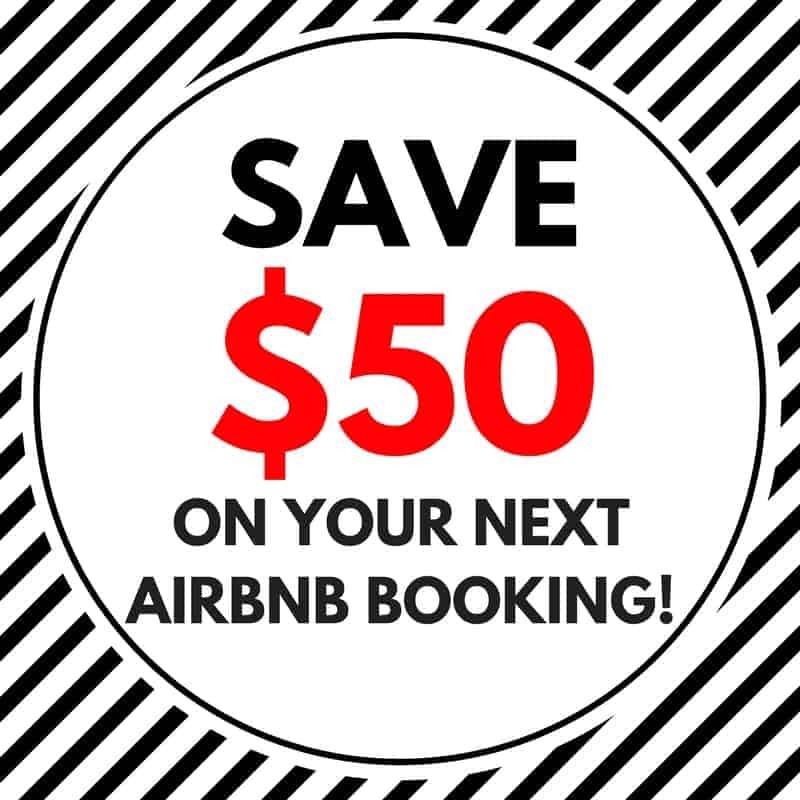 Thanks for sharing this post! I really love all of the photos that was capture in here in Martinique, everything are stunning and indeed a perfect getaway. I also love looking at the turquoise waters, worth a dip, the water is so clean and clear. Beautiful! 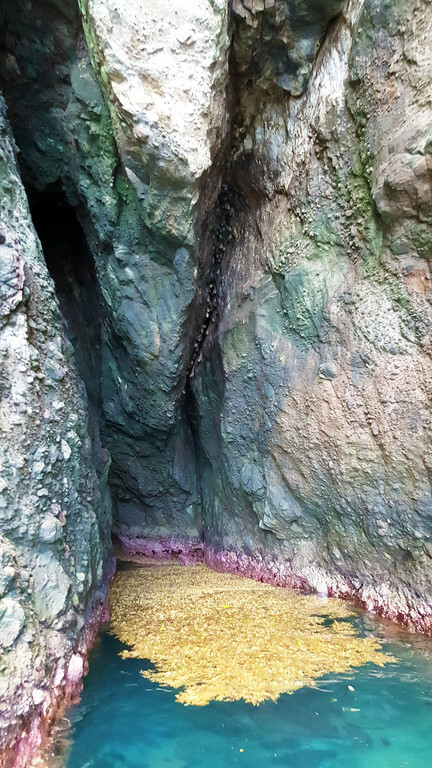 But what are those yellow things on the water at the secret cave? Autumn Leaves? Caribbean Islands never fail. That’s so weird about the lady who wanted to comment on your relationship status! Some people are strange and just don’t understand and respect boundaries. There are some old-fashioned people in this world who feel it’s their duty to point out what they think is wrong. But the cat cruise otherwise sounds amazing! Sorry the snorkelling wasn’t as fabulous as you’d hoped, but just getting into that beautiful water would have been perfect for me. The township looked cute, even with the rain. Martinique seems so pretty and the views are stunning. You even found a secret cave! It seems like you had a perfect day, except for the meddlesome lady on the boat. I would like to try snorkeling in Martinique to see different kinds of fishes and also I’d like to try other water activities. I want to witness the beauty of the small secret cave also. I would really love to try them all someday. Thank you for sharing this post. I really enjoyed reading this article, it seems like Martinique is absolutely amazing! I bet the rum has so much flavour. 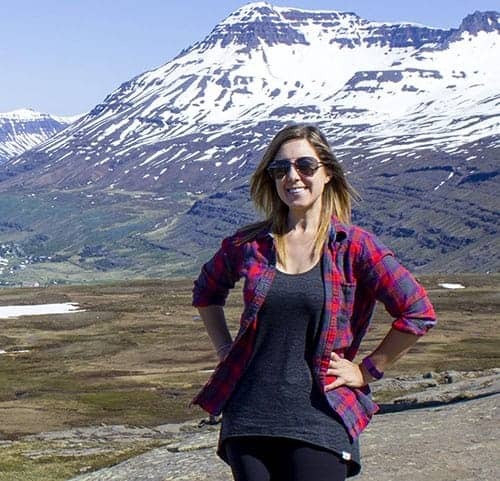 Thanks for sharing this article, I’ve bookmarked it for future travel plans.